PAUCARÁ, Peru, Feb 7 2010 (IPS) - Although Huancavelica is the poorest region of Peru, it has more than just poverty, malnutrition and unmet needs. There are also women using their creativity, efforts and traditional indigenous knowledge to improve the diets of their families and communities. “Have you ever had coffee made from chuño (freeze-dried potatoes)?” a young villager asks with a smile before introducing this reporter to the creator of this culinary invention, Marina Huamaní. She lives in Padre Rumi, a village in the district of Paucará in Huancavelica, a department (province) in south-central Peru, where 86 percent of the total 400,000 inhabitants live in poverty and approximately 45 percent of children are malnourished. The provincial capital of Huancavelica, in the rugged Andean highlands, is 450 km southeast of Lima, and Padre Rumi is a three hour drive away over a rough road. Huamaní puts no importance on her talent in the kitchen. But thanks to her culinary skills she has been able to come up with a number of recipes based on a wide range of highly nutritional traditional products that are playing a crucial role in fighting malnutrition in her community. Her ingenuity even earned her a prize in a cooking contest organised by the United Nations Food and Agriculture Organisation (FAO) to foment the consumption of nutritional foods by peasant families in this poor area. In late 2009, the World Food Programme (WFP) announced that the number of hungry people had crossed the one-billion mark, and FAO, which warns that global food insecurity is a growing threat to humanity, estimates that the total could rise by a further 100 million this year. “Women are important in the raising of livestock, the preservation of crop varieties and the preparation of food,” says agronomist Hernán Mormontoy, coordinator of a development project that FAO is carrying out in four villages in Paucará. “And that is especially true today, with the impacts of climate change, which are accentuating poverty in the Andes,” he tells IPS. Huamaní, 49, is one of the beneficiaries of the initiative, which is aimed at strengthening community organisations, reviving consumption of traditional foods, and forging links between agricultural production and the market to boost local incomes and guarantee food security. The people in charge of the project say that one of the challenges they run up against is the deep-rooted culture of machismo. Generally, in these communities, “what the man says goes,” says Edwin Rivera, an agronomist engineer with the Lima-based Centre for the Study and Promotion of Development (DESCO), which is working with FAO. Of the 82 peasant facilitators of the project in the four participating villages in late 2009, only 18 were women. Although women’s participation in the project is still weak overall, there is one exception: the village of Anchonga, where 12 of the 25 facilitators are women. “We are trying to turn this situation around, so women and men will play an equal role,” says Rivera. “I entered the contest with a complete meal based on chuño: I made a chuño dish with onions and meat, along with soup and coffee,” says a smiling Huamaní during a break in a community project, where IPS found her digging a ditch with a pick and hoe. And how did she come up with the recipe? “It came from inside me, from my thinking, from my heart,” she says in Quechua, her native language. Chuño is prepared with a traditional method that involves freezing the potatoes overnight in the intense cold of the altiplano before dehydrating them by squashing them flat and laying them out on the roofs to dry in the sun. The food preservation technique has been used for centuries in highlands areas like Huancavelica, where there are 800 kinds of native potatoes, of the 2,500 varieties in Peru, according to FAO. Besides chuño, there are other nutritional native foods like quinoa, also known as Inca wheat; oca, a root vegetable; amaranth, a traditional grain; the root vegetable olluco; and tarwi or Andean lupin, whose seeds are used in different recipes. Women have begun to revive the use of these traditional crops in this corner of Huancavelica, not only for family consumption, but for sale as well. Thus, besides improving the local diet, crop biodiversity is being preserved in this highlands area, where indigenous peasants make up more than 90 percent of the population, the FAO project says. The cooking fairs also promote other traditional foodstuffs like cochayuyo, a kind of kelp that is high in iodine, and the wide-growing airampo, which women use to flavour porridge and beverages. But there are foods that have fallen into disuse because the preparation techniques have been lost. That’s the case of tarwi, which locals say “tastes like poison” because it is bitter due to a high alkaloid content. But Huamaní, who has cooked for seven children and four grandchildren, says she learned from her mother to soak the seeds in abundant water for a month, remove the pods, and cook the tarwi with tuna and onion. FAO has begun to give workshops on tarwi preparation and how to improve its production on the plots of the 1,000 people involved in the project. As part of the effort, they have arranged visits to the villages in Paucará by “yachachis” (traditional Andean teachers) from Cuzco. Juvencia Oregón, one of the participants, now prepares meals with tarwi for her family. “Before cooking it, you have to ‘de-bitter’ it, hanging it in the river for up to eight days, until the yucky taste goes away,” she explains. Florencio Layme, one of the leaders of the facilitators, has improved production of tarwi with the help of his wife and six children. From an initial yield of 150 kg on one hectare of land, the family’s production of the crop has gone up to 650 kg. “My family helps till the earth, spread the fertiliser and plant,” says 53-year-old Layme. It is the women who usually select the seeds. “My grandparents taught me that,” says Dionicia Carbajal, who has an organic garden where she grows beets, lettuce and tomatoes to diversify and improve the family diet. “I no longer have to buy vegetables in the market,” she says. Women also help prepare the clay for the adobe bricks used to make the local houses. And they are especially skilled saleswomen, like Máxima Silvestre, who runs a dairy products business with her family that she calls Semillas de Vida (Seeds of Life). But water shortages and the loss of crops as a result of climate change have a heavy impact on women, who are in charge of feeding their families. 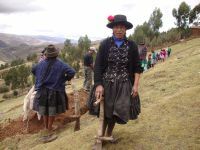 “Sometimes we have to walk really far to get water,” says Marina Quispe in Padre Rumi, where piped water is available just one hour a day and there is no sanitation. Some women are forced to migrate to cities in search of jobs. “Mothers and daughters leave during the vacation months, from January to March, to work as domestics and cleaning women,” says Rivera. “Some come back, but others never do,” he says, adding that the biggest challenge is getting the entire family involved in development projects of this kind, to improve their prospects in the poorest region of the country.